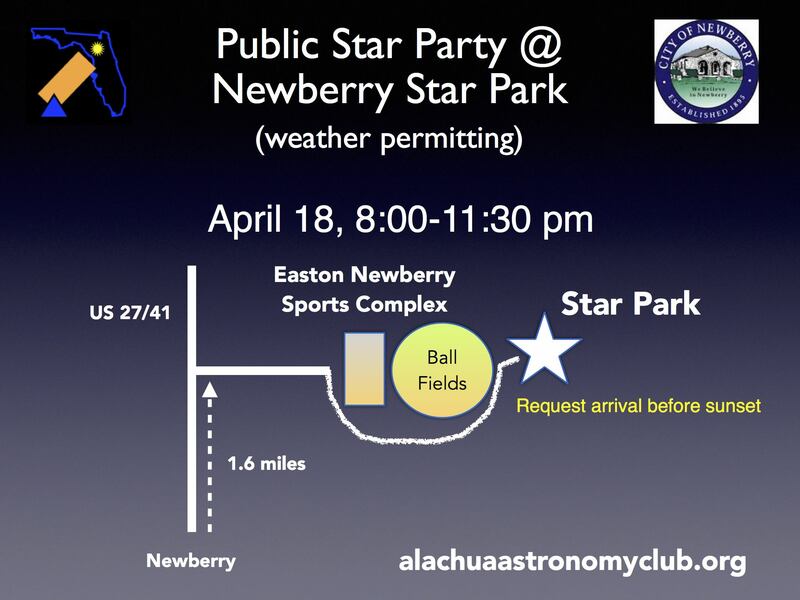 Star Party / Public Outreach at Newberry Star Park in the rear of Easton Newberry Sports Complex. AAC Members and Newberry residents are invited! "GO" or "NO GO" will be given at 12:00 noon day of event. 1. New Moon! Conditions are ideal for deep-sky viewing. 2. Mars, Venus, and Jupiter are visible soon after sunset. Mercury will be low, but might be visible. Saturn rises at 10:33pm. 3. Newberry Star Park is the ideal place to see objects nearly all the way to the horizon. 4. Lyrid meteors peak on April 22nd. We may be surprised by earth-grazing meteors around 11:30pm when Lyra comes into view.